Gillette's 2in1 formula pairs shaving gel with powerful skin care. 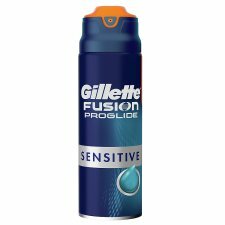 Gillette Fusion ProGlide Sensitive Men's Shaving Gel brings you a smooth shave from start to finish with a specialized formula that hydrates to soften hair, protects your skin and improves razor glide for an incredible shave. Even better, the redesigned canister has a clean-dispense actuator, a rust-free bottom, and a gel gauge, for no mess, no rust, and no guessing.